In 2007, Storen's senior year at Brownsburg High School in Indiana, he committed to a scholarship to Stanford. And Drew accepted the scholarship, attending Stanford rather than signing with the Yankees, who chose him in the 34th round of the 2007 draft. (Scouts knew Storen was too tough a sign because of his committment to Stanford.) At Stanford, Storen's major was mechanical engineering. In 2005 at Brownsburg High in Indiana, he and future Cardinal Lance Lynn were teammates. Drew has the makeup scouts love. He is a cerebral pitcher and a fine citizen off the mound. He is also very funny, a comedian like his father. Drew is an extrovert who never met a stranger. Storen listened as Cordero described his career path. He pitched in the College World Series at Cal State-Fullerton. He was drafted in the first round. He had been called up in September. It all sounded so cool. Storen has not spoken with Cordero since, but he never forgot. Before college, all he wanted to do was pitch in the College World Series. At 16, the Majors didn't seem like an option. As a freshman in high school, Storen had been only 5 feet 8, 120 pounds. When he was younger, he would ask his father, "When am I going to grow?" Drew is the son of former XM radio baseball broadcaster Mark Patrick. Storen's entire baseball life has been lived in the spotlight. Growing up in Brownsburg, Ind., he was known as "the sports guy's kid." As a high school and then college pitcher, Storen's progression has been tracked by a national group of fans while his father served as host of XM Satellite Radio's morning MLB program. (Mark Patrick and Buck Martinez did a superbly entertaining job every weekday morning from 2006 through 2008. They kept the true baseball fan highly informed.) One fan of the show even set up the "Drew Tracker" on his blog. But it was when no one was watching or listening when Patrick and Storen did their best work, dad coming home between local newscasts to soft toss with his son while still wearing his necktie. Storen's also not too worked up because he's already experienced the draft circus. In 2007, the Yankees made him a New York message board sensation by dangling a six-figure check and the promise of a fast track to a locker in the Bronx. But the high school All-American chose to go to The Farm in northern California because "after one visit, I knew I was the perfect place for me." While at Stanford, one of his classes inspired him to design one tricked-out pair of baseball cleats. So Drew pusued a degree in product design. He combined his love of drawing with an interest in creating new products. "I actually designed an iPhone my freshman year in high school," he said, laughing. "It was totally different, obviously. That was a big filter for me when I looked at schools, whether they had product design or industrial design. I would love to go work for Nike or a sports company and design cleats or use my baseball knowledge and my product design knowledge to help create something unique. "I feel like there are some things that either look really cool but don't work very well and some things that work well but don't look very good, so I feel like I can help out in that area." In the spring of 2010, the Baseball America Prospect Handbook rated Storen as the 3rd-best prospect in the Nationals' organization. May 23, 2010: Four days after getting his first career victory, Drew collected his first career hit in a 4-3 victory over the Orioles. Storen entered the game in the top of the sixth inning to replace lefthander John Lannan. In the bottom of the inning, Storen, a switch-hitter, made his first plate appearance since high school. He took the bat boy's double flapped helmet and swung from the left side of the plate. "I didn't have anything to lose," he said. "I was trying to have fun with it. I tried not to embarrass myself," Storen said. "I had to make an adjustment of seeing a man on the mound. I'm used to seeing a kid. That's the first thing that came into my head." Storen took an 0-2 pitch from righthander Kevin Millwood and singled to left field. On June 24, 2011, Drew's grandmother passed away in Indianapolis, so he went home for the funeral two days later. The Storen family has great Christmas traditions. "I remember Christmas mornings were my favorite, because I always got two baseball gloves. That was something Dad would always give me as a kid. On top of that, spending time with your family and celebrating with your family. From a baseball standpoint, it was always baseball glove day. I would get two new gloves for Christmas. It was always a lot of fun for me," Drew said. "I still have all of those gloves that he gave me. He has them all lined up, [including the ones] I used last year. He has them in chronological order, starting from when I was 7 years old. He always got me the gloves with my name sewed in, even when I was seven, which was pretty unheard of at the time. That was my favorite part about Christmas." Drew, who studied product design at Stanford and designs his own shoe patterns for fun, used 37 baseball caps during the 2012 season. Storen, a baseball equipment aficionado, cycled through seven gloves, blue or red, last season. He prefers them stiff because he likes resistance when he squeezes his left hand closed as he delivers the ball to home plate. He had his Twitter handle, @DrewStoren, engraved along the thumb on one glove but used it only once and had to black it out with a marker after league officials saw Storen use the glove during one of his rehab starts and sent him a warning letter. Drew’s father, Mark Storen, using the stage name Mark Patrick, was a longtime sportscaster and had a Major League Baseball talk show for what was then XM Radio. So Drew was steeped in media tradition. Asked how much influence his father had on him, Storen said: "A ton. The sooner you face the music, the sooner it goes away. I'd much rather stand there and tell you my side of things. It's nothing personal. You guys have a job to do. Dad said you should always be there. It's easy to sit there and do interviews that are good. You have to stand there and answer questions when things aren't going well. That's part of the business." How refreshing. Storen is smart, affable and well versed. He was drafted as a junior and wants to eventually return to Stanford and finish his degree in product design. Storen loves to draw and wants to design baseball cleats someday. His mother, Pam, is a graphic designer, and he inherited his artistic side from her. Because of his education, Storen said he believes he's playing on "house money." Because when his baseball career ultimately ends, he'll have his education to fall back on to take his life in another direction. But for now, his goal is to keep improving as a pitcher. "Drew is smart. He's always been smart," Nationals pitching coach Steve McCatty said with a hearty laugh. "But sometimes smart can kill you in baseball. Drew is a tinkerer. But all the tinkering in between has allowed him to come up with a really, really good changeup. So because of it, Drew has become a much better pitcher." Drew expressed regret and frustration while discussing his self-inflicted broken thumb that ended his 2015 season. Storen suffered the injury after a rough outing against the New York Mets on Sept. 9. Soon after Storen allowed a go-ahead two-run homer to the Mets' Yoenis Cespedes in the eighth inning of an eventual New York win, the right-hander returned to the Nationals' clubhouse and slammed his locker shut. The impact resulted in the non-displaced fracture in his right thumb. 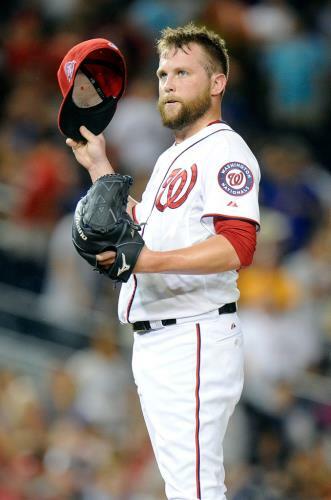 "Obviously, I was a little frustrated with my outing, but I had no intention [of causing harm]," Storen said. "I'm not the type of guy to punch a wall or do something like that. It's not what I was aiming for." Storen was told that the recovery from the fracture could take four weeks. "It was tough, especially when you look at the timetable," he said. "It's not something that really heals all that quickly. It's been a frustrating year all around. It's tough news to take, but all I can do now is try to take care of it." (Raby - mlb.com - 9/17/15). January 8, 2016: When Storen's phone rang, he noticed that Nationals general manager Mike Rizzo was on the other line. He figured Rizzo wasn't calling him to say, "Happy New Year." Storen turned out to be right. Rizzo called to say the right-handed reliever had been traded to the Blue Jays for outfielder Ben Revere. The trade for Storen may mean he will be the closer in Toronto. Storen thanked Rizzo for drafting him as the 10th-overall pick in the 2009 Draft. The 28-year-old pointed out that he was able to move through the system quickly and have success in the big leagues. Storen said winning the 2012 National League East title was his best moment in a Nationals uniform. "It's sad. I'm going to miss D.C.," Storen said. "I'm forever thankful for the opportunity I was given and the way I was treated by all the fans. I really enjoyed my time [in Washington]. I can't put it into words what it meant to help create something special for the organization. By the time Drew made his Major League debut on May 17, 2010, with the Washington Nationals, he was well ready. This was a moment more than a decade in the making. Storen had gotten the professional experience long before then. His father, Mark, was a broadcaster at WISH-TV in Indianapolis, and on days when he was scheduled to cover the Indianapolis Indians -- then the Reds' Triple-A affiliate -- he would bring Drew along and let him soak it all in. "I got to see what it was like to be in this light, and it just fueled my dreams even more," Drew said. "So I'm always thankful that my dad stuck his neck out for me and took me along to all those things." While his father worked, Drew made the most of his unique opportunity. He played catch with former Reds third baseman Aaron Boone. He even learned his current fastball grip from the Indians' pitching coach. All of it was part of Mark's plan. "I tried to take him to Colts camp and Pacers games and Indians games and just expose him to those types of situations and let him actually meet guys who were playing at that level, so that eventually those were situations that he would have already been in and not be overwhelmed by them," Mark Storen said. Drew also served as a bat boy for the Montreal Expos from 2000-04 when they would stop in Cincinnati or St. Louis. In '07, he was drafted out of Brownsburg (Ind.) High School by the Yankees in the 34th round of the MLB Draft. Instead of signing, Drew chose to play baseball for Stanford. Two years later, the Nationals made him the the No. 10 overall pick in the 2009 MLB Draft. For Mark, it was an affirmation of the amount of time his son put in and his own choice to introduce him to the pro ball environment at a young age. "It was always a strange thing for me, because I always had to question whether I thought he was really good because of my being around professional athletes and knowing what kind of ability they had, or if it was because I was his dad ..." Mark said. "You can want it for your kid all you want, but until he gets it and until he wants it, it's not going to happen. And he realized at a young age that he was going to have to work much harder than everybody else if he was going to make it, and he always did that work." He became a free agent after the season, and on January 3, he signed with the Reds -- an organization he already had tremendous ties to. "It was meaningful for me to see him wear that uniform, because I had worked for the Indianapolis Indians in the '70s and [saw] a lot of members of the Big Red Machine-era teams come up through Triple-A and have success at the big league level," Mark said. "So I always have that connection." In 2017, Drew had the chance to play for the team he spent so much time around as a kid, and with a former high school teammate in catcher Tucker Barnhart. And two and a half months in, Drew is on pace to have his best year since 2014. If you were to ask Drew how he's managed this success, he'd point you to the man who gave him the experience all those years ago. July 10, 2009: The day after the Nats chose him with their second first round pick, Drew signed with scout Ryan Fox for a bonus of $1.6 million, starting his pro career. January 17, 2013: Storen and the Nats avoided arbitration, agreeing on a one-year $2.5 million contract for 2013. He can also earn an additional $1 million in performance bonuses. January 16, 2015: Drew and the Nationals again avoided arbitration, agreeing on a $5.7 million pact for 2015. January 8, 2016: The Blue Jays traded Ben Revere and a PTBNL to the Nationals for Drew Storen and cash. January 15, 2016: The Blue Jays and Storen avoided arbitration agreeing to a 1 year deal for $8.375 million. July 27, 2016: The Blue Jays traded Storen and cash to the Mariners for RHP Joaquin Benoit. Jan 3, 2017: The Reds signed free agent Storen to a one-year, $3 million contract. There are additional bonus incentives worth up to $1.5 million, and Storen will also get a $500,000 assignment bonus if he is traded. "First and foremost, obviously being from the area and this being my hometown team, it's special that something like this has worked out," Storen, a native of Indianapolis, said. "It's a great opportunity for me. Obviously, I see a Reds organization that's only going up. It's a young group, and hopefully I can help out some of the guys with my experience." Nov 2, 2017: Drew chose free agency. Feb 15, 2019: The Royals organization signed free agent Drew. Storen can make $1.25 million in base salary if in the Majors, with $900,000 of performance bonuses. Also, Storen has a March 25 opt-out date. 2015 Season Pitch Usage: 4-seam Fastball: 32.3% of the time; Sinker 27.3% of the time; Change 7.4%; and Slider 33% of the time. Drew is able to change speeds quite effectively and has command of his repertoire, especially the heater and curve. He is already a pitcher, mixing that fastball and breaking ball to retire hitters consistently. He goes right after hitters, challenging them. He throws quality strikes. Storen's delivery has some twists, not unlike Luis Tiant. Drew forgets those things which are behind, according to Stanford coach Mark Marquess. "Storen has a short memory," Marquess said. "He's human, so he has bad innings, and as a freshman, he gave up some big home runs at times. But when he walks back to the dugout, you can tell he has already forgotten about it. He's on to the next pitch and the next hitter. You don't teach that. You either have it or you don't." This coming from a man who has coached more than 50 big leaguers, including a couple of pitchers you may have heard of—Jack McDowell and Mike Mussina. Storen gives up some home runs because he leaves pitches up in the zone occasionally. That is his only real weakness: not being able to keep the fastball down consistently enough. Drew definitely is closer material. He has the makeup, aggressive mentality, and fearless demeanor to finish games. And he says he relishes throwing under pressure. "I want to be the guy that loses the game," he said. "I want to be the guy that wins the game. I want it to be my fault either way. I like that. "I'm a guy that has a short memory. My coach at Stanford always said that regardless of whether I did well or whether I did bad I would show up the next day at the ballpark no different. It's a long season; you're going to have your ups and downs. And if you try to ride that emotional roller coaster right now, I would be just like this." (He sags in his chair.) "I'd be going to the ballpark just dead, you'd just be an emotional wreck." Drew loves the competition. He just lights up when he crosses the chalk line on the way to the mound. Storen does not get rattled easily. Drew struggled with his mechanics, his arm slot and the tempo of his delivery in 2013. It got him sent to Triple-A near the end of July to get himself back together in a less stressful atmosphere. Before the 2011 season, Storen dropped a traditional leg kick from his delivery, instead going to a slide step where he stiffens his front leg outward and brings it back, effectively pointing his front hip toward home before coming to the plate. But McCatty said he always preferred the leg kick delivery, which makes Storen quicker to the plate, and believes a "more athletic" style would help Storen prevent his front shoulder from opening up and give him a more consistent release. "He had 43 saves doing it that way," McCatty said. "But right now, he's flying off his arm slot, release point is not the same, and so everything gets affected. It's a snowball effect. So as of right now, I think he's going to go back to the original leg lift, doing the things you have to do to hold runners on and also work on getting that arm slot back, getting that release point back, getting that confidence back." April 18, 2017: They call it an immaculate inning. Nine pitches, nine strikes, three K's. Inning over. And, in this case, game over as the Reds beat the Orioles, 9-3. Drew may have taken the mound in the ninth in a non-save situation, but he brought his best stuff with him. He became the fourth Reds pitcher to accomplish the feat, joining Hod Eller (Aug. 21, 1917, vs. N.Y. Giants), Rob Dibble (June 4, 1989, vs. Padres) and Carlos Contreras (July 11, 2014, vs. Pirates). As of the start of the 2017 season, Storen has a career record of 25-16 with 3.31 ERA, having allowed 31 home runs and 337 hits in 385 innings. Drew had converted 98 of his 120 opportunities (81.7%). Drew was too slow to the plate when he first signed with the Nationals in 2009. So they worked on speeding up his motion to the plate in the Arizona Fall League, so that he can better control the running game. "My pitching coach (in the AFL), Paul Menhart and I,worked on a slide step. It's pretty much the same motions as my windup. I do a leg kick, then drop my leg all the way down and kind of do a slide step anyway," Storen said. "My time to the plate was down to 1.3 (seconds) and that's probably where I need to be." But in 2013, Storen was sent to Triple-A by the Nats, in part because he was so slow to the plate. March 7-July 19 , 2012: Storen was sidelined with right elbow problems. An MRI showed no structural damage, just inflammation. But he began the season on the D.L. And on April 10, 2012, Drew underwent surgery to remove a bone fragment from his pitching elbow. March 13, 2015: Storen underwent surgery on his non-pitching hand, but was still expected to be ready for Opening Day. "He took a swing and it got him," Nationals manager Matt Williams said. "It's an odd thing because you never expect anything like that to happen. But it happened to him." September 10, 2015: Storen missed the rest of the season after he broke his right thumb slamming the lock box on his locker in frustration after his latest outing.The incident happened after Storen gave up the go-ahead homer to Yoenis Cespedes in the eighth inning, helping the Mets complete a three-game sweep and dropping the Nats out of the pennant race. August 19-September 3, 2016: Drew was on the D.L. with inflammation in his right shoulder. September 10, 2017: Storen was on the DL with a right elbow sprain. September 17, 2017: Drew will have Tommy John elbow surgery that will likely sideline him until the 2019 season. September 27, 2017: Reds medical director Dr. Tim Kremchek performed the procedure on Storen to repair a torn ulnar collateral ligament in his right elbow.